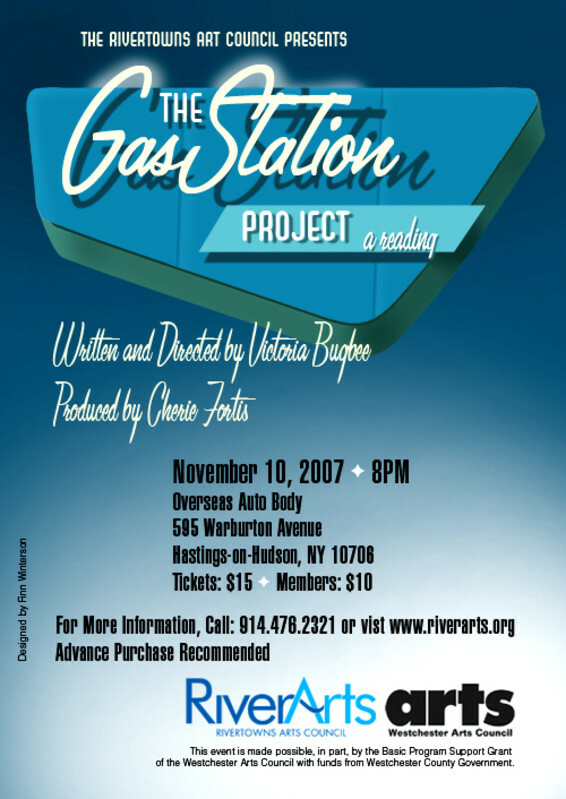 The Gas Station Project is a dramatic comedy set in a rural town in Florida. The play tells the tale of Tammy and Chet, a couple who run a gas station. Their crumbling marriage is told through their eyes, their childrens and their two best friends. The conceit is that the couple play the other characters since children mirror their parents and you pick best friends who are very similar. A narrator who sits in a red convertible leads the audience through 16 different scenes and sets. Poignant and funny, the play with cars as its theme unravels the myth of the American Dream. 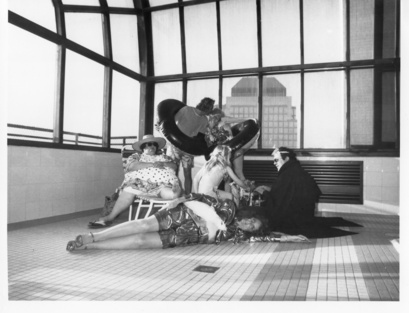 "A Surreal Soap Opera - Toxic Waste Meets Resortland" for 9 actors. 55 minutes with a commercial break for sun screen. Audience Interactive. Bugbee envisioned this play being done with a large cast of extras dressed in beach gear who walk behind the action in the same fashion as people do on the beach. Commissioned by Creative Time and presented by Lincoln Center Out of Doors, Jenneth Webster, producer, Victoria Bugbee directed and produced with Lynn Goldberg Bugbee's original play. The play was restaged at The Village Gate, produced by Stuart Steel Productions and Victory Productions and directed by Malcolm McNeill. The theme song was written by Joe Deihl and Victoria Bugbee. The play is set up like a TV show with a commercial break and a live audience. Set in a beach resort that is really a toxic waste dump, the resorts guest discover that their vacation land is under assault by toxins, deranged seagulls and giant innertubes that fall from the sky to entrap people forever. The rude proprietor turns a cold eye to their plight as she contemplates her next round of plastic surgery. Ms. America Barbie arrives trapped in a tube and falls in love with the lounge singer, who is also trapped. They perform a pas de deux in inner tubes. The black comedy ends when the toxic fumes engulf the stage. Throughout the play, the audience participates on command to blow bubbles, put on their lobster bibs or throw fake breast implants on stage. It is a mad cap farce. "Life and Death With Business In Between" Two Acts with Intermission. L & D is a 90 minute musical with 22 parts for 9 to 22 actors. Note: The leads don't sing. Book and Lyrics by Victoria Bugbee, music by Joe Deihl. Based on the life story of Mrs. Carrie Camisa. As part of the art exhibition, Ten Downtown, Act One was performed in the windows of Benson's Furniture Store in the East Village. 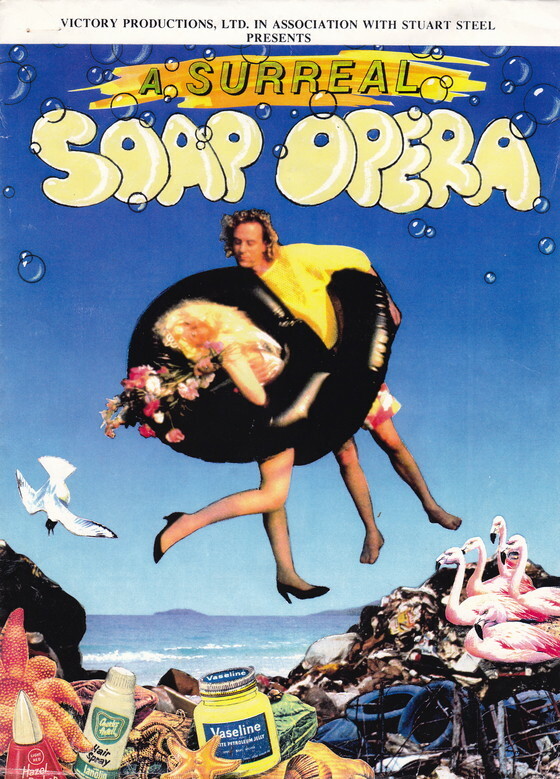 On a New York Foundation for the Arts Fellowship, Bugbee expanded the play into a full length musical. Act One was staged at Our Lady of Vilnius Church in downtown Manhattan and a workshop of the full length musical was held at The Gene Frankel Theater in Noho. Fortunately, Mrs. Camisa and her family attended the workshop right before she passed away. Her dream was to see her story performed on Broadway, Angels and backers are needed to help us make her dream come true. "Confessions of a Baby Slave" One act one woman 15 minutes long. Performed by Victoria Bugbee for New Arts Alive. Reading, PA. and in New York at Performance Soiree produced by Sari Guberson in Tribeca. "Oddicum Jobicum Diplomicum" One Act one woman 30 minutes long. Audience Interactive. Writtten and performed by Bugbee for New Arts Alive Program. Kutztown State University, PA. An Evening of One Acts at The Waxing Thread Performance Space in Soho, NYC, produced by Lynn Pidel. Written, produced and directed by Victoria Bugbee. Previously titled "Laundry." Sponsored by The Bureau of Cultural Affairs City of Atlanta. "The Vacation - Worlds of Desperation." One Act for 5 actors. 20 minutes long. Written, produced and directed by Victoria Bugbee. Sponsored by The Bureau of Cultural Affairs City of Atlanta. The Donald Gallery, Dobbs Ferry, NY, The ABC Gallery Wilmington, DE. This is a traveling exhibition. THE MUSIC SERIES: The Javo Gallery, Atlanta, GA and The Atlanta Art Workers Coalition Show at The Omni. "Music Video - Theme song of Life and Death With Business In Between." Numerous commercial videos that Bugbee produced for B Productions for Burt's Bees, FABB, the short documentary 'Crobar - The Making of a Mega Club produced by Cherie Fortis, Moda Manhattan, HUE, Clairol, Matrix, CBS's primetime special "The Making of Fashion's Night Out" PAPER Magazine, Elle, Harry Winston Rare Timepieces for Baselworld Videowall, Bob's Store Casting Call, Macy's Trend Reports, Oscar de la Renta, JCPenney 2011 Launch and Oscar Fan Video, WGSN Trend Reports from Fashion Week, 22 presentations for MAC + Milk for AOL, Matrix University - Hair Salon Events, Rowenta, Juicy Couture, Wedding March on Madison for Brides Magazine, Glamour's Women of the Year Awards broadcast in Times Square on New Years Eve and GQ's Menswear Videowall at MAGIC in Las Vegas. KABOOM consists of over 25 original pastels and murals of Chinatown and Fireworks. The exhibition has been shown in New York City, Wilmington, DE., Hastings-on-Hudson, and Dobbs Ferry where the show was featured in the New York Times Metro Section. The Times dubbed the show KABOOM and Bugbee adopted it as the show's moniker. When it was shown in the East Village in The Ten Downtown show The New Yorker wrote in its listing that the 5 x 6 foot mural "Life and Death With Business In Between" as the definative picture of Chinatown. The oversized pastel depicts live carp swimming above a birds-eye-view of a street market called the Tin Duc and dead fish displayed on ice underneath the vegetable stands. Highly viseral and graphic, a few viewers have said they can actually smell the fish markets in Chinatown. Bugbee is constantly adding new works to the exhibition. Copyright Victoria Bugbee 2013 All Rights Reserved.